Mmm mm! 4 oz. crab cake with Israeli couscous (our current obsession) cooked in crab stock. I’m back! I spent the last month working at a clinic in the coastal fishing town of Westport, WA. I had some of the best seafood ever while I was down there – crab, salmon, tuna, spot prawns all fresh off the fishing boats. Before heading back to Seattle, K., the gal I was staying with, hooked me up with 6 Dungeness crabs to take home. Whoohoo! I also had the clams we dug up the day before, salmon a neighbor brought over from his fishing, and blueberries I picked from the shrubs outside the house. It was some seriously sweet loot to take home. My dad is in town and Dungeness crab is his favorite. We feasted on steamed crab with fresh ginger spiked black Zhejiang vinegar for dipping. I cleaned and picked out the meat from the leftover crabs for crab cakes. Dungeness crab is one of the meatiest crabs but even so, it took two very large crabs to yield one pound of crab meat. Jumbo lump Dungeness crab meat goes for around $25 a pound at my local fish market. Pretty darn steep in my book but it takes about three to four pounds of whole crab to yield a pound of crab meat and then factor in the time spent to get the crab out of the shell, the price is understandable. Too many recipes out there have all sorts of fillers added to the crab – onion, bell pepper, even celery (blech), and calls for way, way too much bread crumbs. You end up with an onion flavored hockey puck. No thank you! The best crab cake in my book is made with as much crab meat as possible, no veggies, and minimal bread crumbs. I use panko because it’s light and airy and won’t weigh the crab down. Don’t even think about using the stale stuff that comes in a cardboard canister. The most important step is to thoroughly chill the cakes for at least an hour so they get a chance to set up in the fridge, otherwise the cakes will fall apart in the pan. Pick over the crab meat and discard any pieces of shell. Drain the crab meat on a few sheets of paper towels to soak up any excess moisture. You may have to gently squeeze the crab meat to remove excess liquid (you don't want to go overboard and have it end up bone dry either). In a small bowl, whisk all of the ingredients together except for the panko and crab meat and mix into a smooth sauce. Pour over the crab meat and add the panko bread crumbs. Gently fold together the crab, sauce, and bread crumbs. Try to keep the large crab meat pieces intact while mixing. Divide the mix into 4 and squeeze the mixture tightly together to form a 3 – 4 inch patty that’s roughly 3/4 inch thick. Put the crab cakes on a plate and cover with plastic wrap. Chill for at least an hour, up to overnight. Pour some panko onto a plate and bread both sides of the crab cake with the bread crumbs. Heat 2 tablespoons of vegetable oil in a nonstick skillet over medium heat. Fry the crab cakes 4 – 5 minutes on one side then carefully flip and continue to cook for an additional 4 – 5 minutes. If the crust is browning too fast, turn the heat down. Frying the crab cakes slowly ensures that they are heated through by the time the crust get crisp and golden brown. Resist the urge to flip the cakes more than once because they are more likely to fall apart with repeated flipping. Yes! 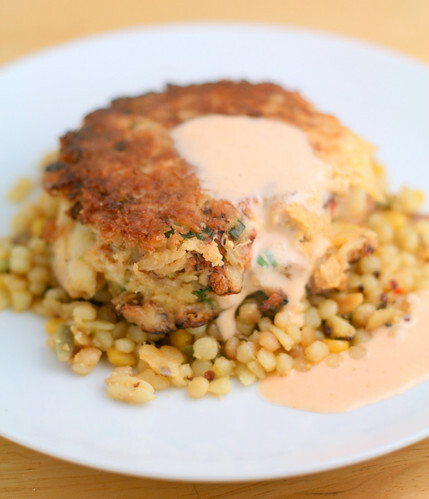 Great crab cake recipe where you're not searching in vain for any skerrick of crab amongst all the filler. Looks nice and crabby! I looove crab cakes. Looks like a good recipe. Glad you're back. Just found your blog recently and was looking forward to seeing more. The cost would have had the best seafood. 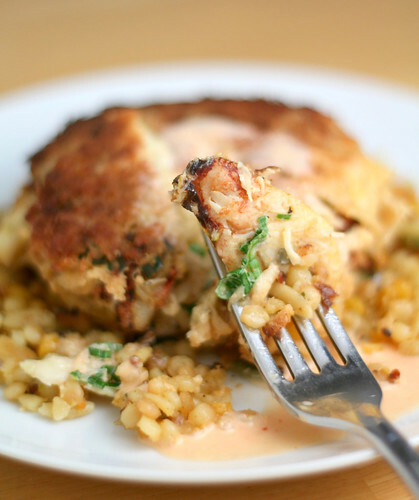 Thanks for sharing this delectable crab cake recipe. Do you have a recipe for that couscous? It looks delicious! I chopped up a slice of bacon and cooked it over medium heat until some fat had rendered out. Then I threw in the couscous and toasted it in the bacon fat for a minute. Then I added crab stock, grated ginger, salt and pepper and cooked until the couscous was al dente. I forget the exact ratio of couscous to liquid but it's on the back of my package. Lemme know if you need me to check and I can do that for you. So glad you got to spend some time in my part of the world -- we are completely spoiled by having easy access to wonderful seafood here in New England! welcome back! these crab cakes are gorgeous!! they look so savory! Boy these crab cakes do look delicious! One of the best things you can do with food you really love, is pair it with a palette pleasing drink. Mixed Drinks Made Easy! offers hundreds of drink recipes that you can pair with your favorite foods for a real celebration of flavor! The crab cake looks divine. Dungeness crabs have a small place in my heart. My grandmother lives in Birmingham,England and one of my favorite memories when visiting her was going to the Bull Market (a huge open market full of every type of vendor you can imagine. She would always take me to her favorite vendor and let me help pick out which Dungeness crab we were going to have that evening for dinner. I will have to give this recipe a try, thank you for the wonderful post! Great crab cake recipe where you're not searching in vain for any skerrick of crab amongst all the filler. The best of seafood goes in there. Looks nice and crabby! Plus a pack of my favorite cigars Habanos. Can you substitute salmon in place of the crab - I am allergic to seafood but this looks sooo good! I tried emailing you but it's not on your blogger profile. I apologize for the delayed response, but yes you can use salmon. Use cooked salmon and then break up the fish into flakes and it should be good to go. Let me know if that works.